If you had to pick one word to describe Holland America Line, that word would be "venerable." The brand is arguably the most historic and tradition-laden on the seas. Its first ship, Rotterdam, set sail on a voyage between Holland and New York in 1873, and, today, Holland America ships sail all around the globe. The line was originally named the Netherlands-America Steamship Company, but it soon became known as the Holland America Line because it carried great numbers of immigrants from Holland to America. The company concentrated on the transatlantic passenger trade, as well as on commercial freight shipping until the 1970s. Its first purpose-built passenger ship was constructed in 1973, and, since then, the line has excelled in cruise vacation travel. In 1978, Holland America moved its headquarters from Rotterdam to Stamford, Connecticut. The company's headquarters then moved to Seattle, Washington, in 1983, in order to consolidate operations with Westours, an Alaska tour company in which Holland America purchased a controlling interest. In 1988, Holland America purchased Windstar Cruises, operator of four- and five-masted, computer-guided sailing ships. It ultimately sold Windstar to a smaller ship operator. One year later, Carnival Corporation acquired Holland America Line, which remains headquartered in Seattle. Holland America is now a U.S.-based cruise line, but it continues to maintain strong ties with its Netherlands heritage. Ships in its fleet -- since the 1890s and continuing today -- bear the suffix "dam." Most of the names are inspired by actual dams that traverse the rivers of the Netherlands. Others, such as those within the Vista Class, represent points of the compass. (Oosterdam is east, Westerdam is west, Noordam is north, and Zuiderdam is south.) Many of the names are in their fourth, fifth or sixth incarnations. 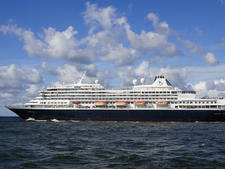 Eurodam was christened in Rotterdam in 2008 by none other than the Netherlands' Queen Beatrix. 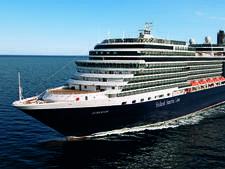 Nieuw Amsterdam, HAL's newest offering, was christened in 2010 by the Netherlands' Princess Maxima, marking the 11th time a member of the Dutch Royal Family served as a HAL godmother. Built in 2000, Amsterdam is smaller than the line's Vista and Signature classes of ships and a recently had Canaletto, a casual Italian eatery, installed. Holland America welcomes a second ship to its Pinnacle Class in 2018. Nieuw Statendam will follow in the footsteps of Koningsdam, the line's largest ship. Prinsendam, Holland America's smallest vessel offers destination-immersive itineraries and superb value for money. Traditional and upscale; emphasizes music and gourmet dining; features Billboard Onboard, Lincoln Center Onstage, B.B. King's Blues Club; holds about 3,000. Traditional emphasis on gourmet dining, live music and an impressive art collection; highlights are the Culinary Arts Center and B.B. King's Blues Club; holds fewer than 3,000. Holland America's ships afford a traditional cruising experience with modern touches that don't feel overbearing. The refined fleet holds onto numerous traditions, such as afternoon tea and extensive art collections, but keeps the onboard ambience fresh with innovative dining and entertainment options. All of the ships bear a similar look and feel with vintage-style navy blue hulls, understated decor with pops of color and artsy fixtures, classy dining venues, bold theaters and simplified pool areas (no waterslides or party stages). The line offers a wide array of daily activities, which include enrichment programs like cooking classes, wine tastings, mixology classes, art events, themed trivia games, fitness classes, Digital Workshop seminars, movies and other special interest events during the day. Nightlife is fairly understated with predinner cocktails generally being the liveliest time. However, numerous entertainment options run the gamut from production shows and live band performances to dancing, piano bar sing-alongs and occasional late nights in the nightclub. Holland America has introduced some innovative options, including new partnerships with Afar, BBC Earth and UTrip. Afar destination guides will provide exclusive digital content (on the line's website) for up to 400 ports, as well as "authentic recommendations" for top attractions, new destination content for shore excursions and more. BBC Earth offers a plethora of onboard enrichment, including live musical concerts, photography classes, an interactive BBC quiz show and exclusive programs for kids. Details of the UTrip partnership are still being rolled out, but the new linkup will eventually allow passengers to build and customize "the perfect trip." The B.B. King's Blues Club experience, which debuted on Eurodam in March 2013 and has since been added to a handful of ships, is a HAL favorite. In each ship's Queen's Lounge, passengers can enjoy music and entertainment straight from Beale Street in Memphis. HAL also has recently teamed up with Billboard Onboard to add a new musical experience under the same time. Found on Eurodam, Koningsdam and Oosterdam, it consists of a sing-along piano/guitar spot focusing on hits from a number of eras and genres like pop, rock and country. Holland America has always paid attention to the culinary arts in its dining and enrichment offerings. It offers both traditional set-time, same-tablemates dining, as well as "As You Wish" dining, which allows passengers more flexibility in choosing when and with whom they eat. The line was a pioneer in introducing the alternative restaurant concept, with the introduction of Odyssey Restaurant (now Pinnacle Grill) onboard Rotterdam. This signature fine dining venue has consistently offered excellent dishes inspired by the Pacific Northwest; it also hosts "An Evening at Le Cirque" once per cruise, on sailings longer than a week. The pop-up experience consists of a tailored menu of French Continental cuisine, wine selections and decor from the land-based venue of the same name. By summer 2017, a Sel de Mer pop-up experience will be available in Pinnacle Grill restaurants on all Vista-class (Noordam, Oosterdam, Westerdam and Zuiderdam) and Signature-class (Eurodam and Nieuw Amsterdam) ships. As the alternative dining trend continues, Holland America has added venues to several ships, including Canaletto (a family-style Italian option) and Tamarind (Asian-fusion). For passengers wishing to do the cooking and not just the eating, Holland America, a leader in onboard culinary enrichment programs, offers Culinary Arts Center show kitchens for demos and hands-on classes. On Koningsdam, the Center also will serve as a farm-to-table dinner venue, available to book for an additional fee. Another signature space is the line's Explorations Cafe, which debuted on the line's Vista-class ships and has since been expanded to other vessels in the fleet. It's akin to an onboard coffee house with a coffee bar selling for-fee beverages, computer stations with Internet, a fantastic library, card and game tables, and comfortable reading chairs that face out to the sea. All cabins offer Mariner's Dream bedding and Euro-top mattresses, Elemis Aromapure bath products, complimentary fresh fruit, no-fee 24-hour room service, bathrobes, nightly turndown service and more. While cabin categories remain fairly standard, the line has introduced spa cabins and lanai cabins (with back doors that open directly onto the wraparound promenade outer deck) on select ships. Holland America has long had a reputation for catering to a well-heeled but somewhat traditionally minded crowd. Perhaps that's due to the line's insistence on maintaining its traditions with elegant afternoon tea, ballroom dancing, tennis courts and timeless decor throughout the fleet. An emphasis on worldwide, often lengthy, itineraries also attracts an older crowd with the time and money for these extended voyages. But standard modern features like Internet cafes and alternative restaurants, coupled with superb kids facilities (Club HAL) and a growing entertainment lineup do entice younger passengers and families alike. Many are onboard as part of multigenerational groups. Don't expect to see lots of children until the summer season, unless you're sailing on a shorter itinerary or during a holiday. In November 2018, Holland America will unveil its second Pinnacle-class ship, Nieuw Statendam. The ship will be nearly identical to Koningsdam, although it is expected to introduce a number of new features (including a specialty restaurant that has yet to be revealed). Fifteen ships comprise Holland America's fleet, which is divided into seven classes. Classes vary by ship size and what's offered onboard (ships within each class typically share a similar design, layout and features). Koningsdam, the first in the newest Pinnacle class of ships, is the largest and most innovative in the fleet with a passenger capacity of 2,650. It includes a handful of firsts for the line, including a two-tiered Lido Pool with an outdoor movie screen, a main theater with an 270-degree LED screen and new restaurants (for example: Sel de Mer, which serves up seafood and French fare in a traditional brasserie setting). Nieuw Amsterdam and Eurodam, which make up the line's Signature Class, are the second-largest in the fleet -- and the newest before Koningsdam. Both roughly 2,100-passenger ships lean more toward the trendy side of traditional, with features like Tamarind, the line's specialty Asian restaurant, and basketball courts instead of tennis courts. 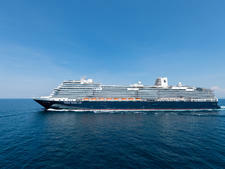 The line's Vista Class includes four ships: Noordam, Oosterdam, Westerdam and Zuiderdam. All cater to slightly more than 1,900 passengers. These ships introduced to the fleet more cabins with ocean views, expanded public areas and contemporary touches like glass-walled elevators. The Rotterdam Class, which was spearheaded by 61,849-ton Rotterdam in 1997, was designed to show off traditional Holland America at its best. Rotterdam, Amsterdam, Volendam and Zaandam are perhaps the most opulent ships in the fleet, with gleaming dark woods, ornate dining facilities, grand atriums and original artwork throughout. 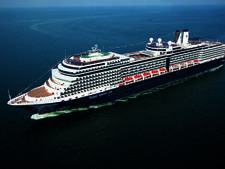 Maasdam, Ryndam, Statendam and Veendam make up the Statendam Class, the smallest of Holland America's mid-sized ships. Launched between 1993 and 1996, these four vessels epitomize the line's vintage charm as the oldest in the fleet. The ships were ordered not long after Carnival Corporation bought Holland America. Since Carnival didn't want the Holland America ships to compete as heavily with its own Carnival Cruise Lines, the Statendam ships were kept to a more modest size, ranging from 1,258 to 1,350 passengers. It's a nice configuration that feels more spacious than other mid-sized ships. Unique in its own way is Holland America's Prinsendam, the only ship in the line's Elegant Explorer Class. 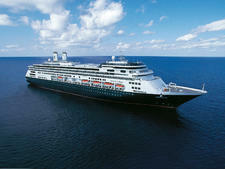 Holland America purchased the 835-passenger ship in 2002. Originally built in 1988, the updated Prinsendam still has its Old World charm, with dark woods and brass accents throughout. But it also has plenty of modern amenities, including a nicely equipped Internet cafe with wireless access and a small but lovely Pinnacle Grill restaurant.